Confession - before last week, I had never tried Nutella. I had always heard people raving about it, but for some reason just never had the chance to try it. Maybe I should have kept it that way because, um, wow. Even my husband who didn't get the Nutella hype was all over it. I bought my first jar (actually, Costco sized tub) of Nutella last week in preparation for hosting Bunco/Girls' Night. Once a month a great group of women in my neighborhood get together to play Bunco, a game that doesn't require any skill or much concentration, so it's perfect for a night of talking and catching up with each other. And of course there is always yummy food and wine. When I started to plan my menu the food came easy, but dessert always stumps me since I'm not much of a baker and don't really eat sweets. I turned to some food blogging friends for ideas and was given one for a creamy Nutella dip with pound cake and fruit. 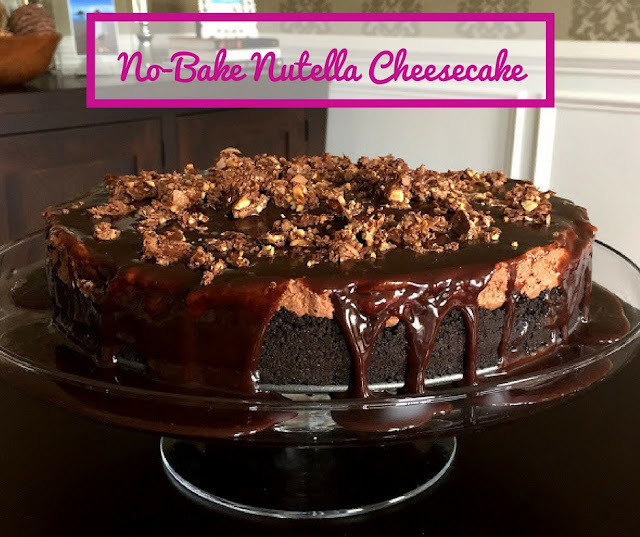 I loved the idea - it would be simple - but then I saw this recipe for a No-Bake Nutella Cheesecake and I knew it would be perfect (and still simple!). This cake has so many textures and flavors - a crunchy Oreo bottom, a creamy and silky Nutella center, a rich ganache topping and finally some crumbled hazlenut Ferrero Rocher candies. To say this dessert was a hit would be an understatement. ... it was such a hit that a few girls even wrapped some up take home to their husbands. I wish I had a picture of the cake once sliced, but it went so fast, and then I may have dropped my remaining slice upside down (don't worry - it was covered with plastic wrap and only dropped on my counter so while smushed, it was still delicious). That just means I need to make it again just so I can photograph it. Actually, I will be making this one many times over, maybe as soon as Easter weekend and then for every gathering and holiday after that. Put this one on your must-make list and then make it soon! Combine Oreo crumbs with melted butter. Press into the bottom of a 9-inch springform pan, being sure to come halfway up the sides of the pan. Set in the fridge to set (at least one hour). Beat the cream cheese, sugar, vanilla extract, Nutella and cocoa powder together in a large bowl until smooth and well combined. Pour filling over the Oreo crust and smooth the top. Cover and refrigerate 4-6 hours or until set (I let it set overnight). Remove cake from the springform pan and transfer to a cake plate (leave the bottom of the springform pan under the cake). Make the ganache: Bring the cream to a boil in the microwave. Pour over the Nutella in a medium bowl. Whisk until combined and silky. 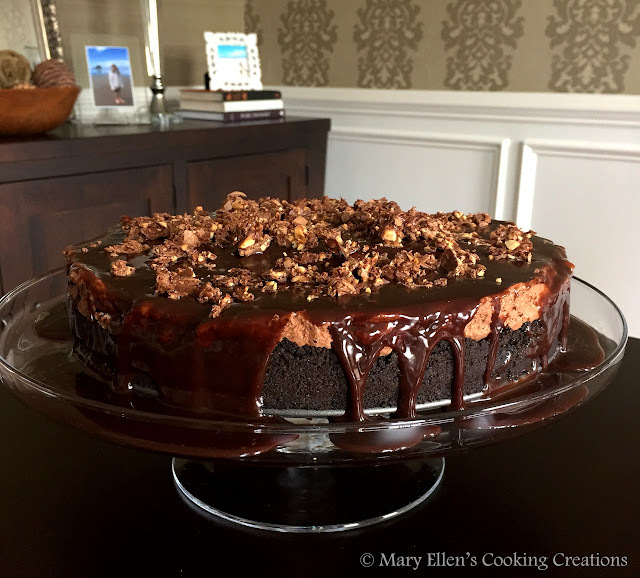 Let the ganache cool and thicken slightly before pouring it over the cheesecake. I used a thin baking spatula to help me evenly spread the ganache over the top of the cake. 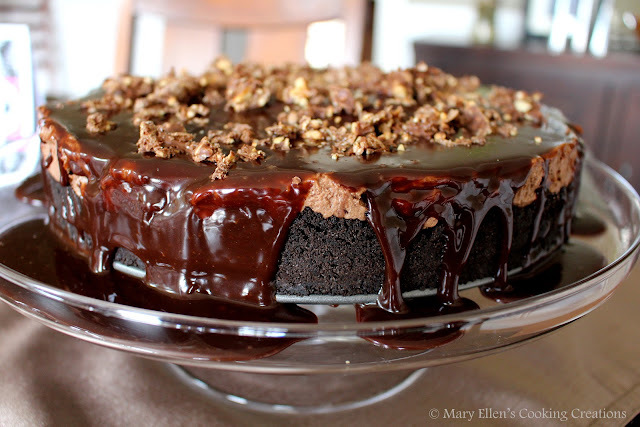 Sprinkle the Ferrero Rocher candies over the top of the cake. Refrigerate until ready to serve. This was amazing!!!!!!!!!!!! It is so nice, looks and tastes as if it came from a bakery. I will be making again.